Sorry for that break in the action, now where were we? Oh yes! 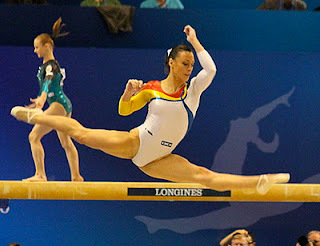 There was the best leotard from Worlds--prize to Great Britain for this understated number. China's never put a lot of effort into their leotards. They almost never stray from red, but sometimes the yellow is a mish-mash swirl of a print on the front. So I have to consider this an upgrade from the usual. Still a lot of room for improvement, however. Yikes, no! This is not improvement! White crushed velvet with sparkly green bits and orange flowers. However, I do appreciate the effort. But the redeeming quality is the nice pop of color when they raise their arms. Sure, it's too bad that it's orange, and we've caught her arms at a bit of an ungraceful moment, but the idea is that it makes your arms look nice and long and that's a good thing. 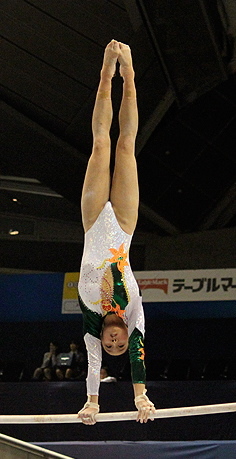 It's a great color for leotards. But almost no countries have it for a national color. It's OK, countries, to branch out a little; we won't think you unpatriotic. The Australians have been embracing purple ever since former Shannon Miller coach Peggy Liddick moved down under and told them how sad their green and yellow leotards were. No one's ever told me why Australia's colors are green and yellow when their flag is red, white, and blue, but I suppose I could google it, or ask Siri. So purple from Australia on the left, and Gabrielle Douglas of the US on the right. It's a great color for her! Also a prettier purple than the Australians. 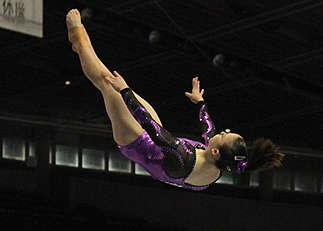 Aussies, I'd like you to reverse that leo and show me black on the bottom and purple on the sleeves. I still like it, though, just nitpicking here. 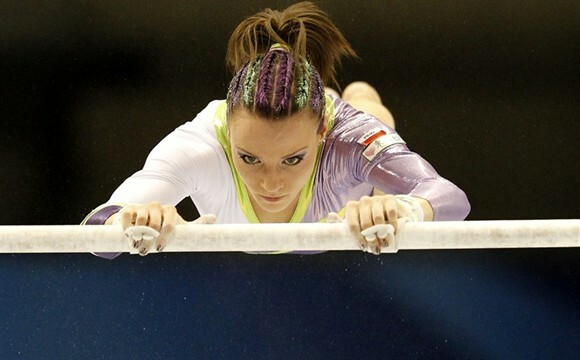 Bonus points for matching your hair to your leotard. Or 0.2 deduction, I haven't decided. I like this look for Germany. It's a happy medium between old-school color blocked leos and new obnoxious swirly snake ribbon embellished leotards. It's a wee bit busy, but still pretty flattering and nice placement of colors. But dude. ROLL YOUR SLEEVES DOWN. It will look SO much better when you roll your sleeves down. You are giving yourself stumpy arms. Russia and Canada went for a similar color, and I like it. I'm not thrilled with the polka-dot effect of the crystals on Canada's leotard, but I realize I gave top honors to Britain when they had the same issue so I guess I can't complain. I just liked that one enough to overlook the polka-dottiness. Two looks from Romania...traditionally the worst offender of rolled-up-sleeve arm stumpiness. Their finals look (above) is one of their best in recent memory. I'm not a fan of white but that white is thick and glossy enough for a nice sleek look. It's fairly clean and not too busy. And wonder of wonders, her sleeves aren't rolled up. [Side note: I fully intended to make this ONLY about leotards but I have to talk form here. How much better would that jump look if she had better arm placement? Have you noticed why the Chinese make everything look so good? It's because they work arms, even in the middle of tricks.] Meanwhile, the plainer one is a little sad. And there we are with the stumpy arms. I find the logo placements really distracting on both. But I guess that's the point, if you're the sponsor or the leotard manufacturer. What in the Worlds needs to be changed?